Anime shows are popular not only in Japan or China. They are watched all over the world. Animes are written especially for children and teenagers. As their storyline is interesting, adults watch them too. A show you may have liked during childhood may have gone off the air or the Government may have blocked your favorite channel. If you’re feeling nostalgic or if your TV service provider doesn’t air anime channels, you can use the following apps to watch anime on your Android or IOS mobile device. YouTube is a popular site. You’ll find TV shows, movies, short clips, documentaries, trailers on YT. YouTube also gives you an access a massive collection of cartoon and anime videos. 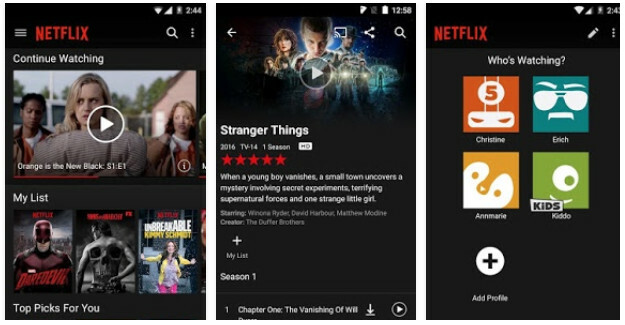 As it is the most popular video streaming service, media companies upload the latest shows on YouTube immediately after airing it on the TV channel. Hence, you can use YouTube to watch anime shows you’ve missed on TV. 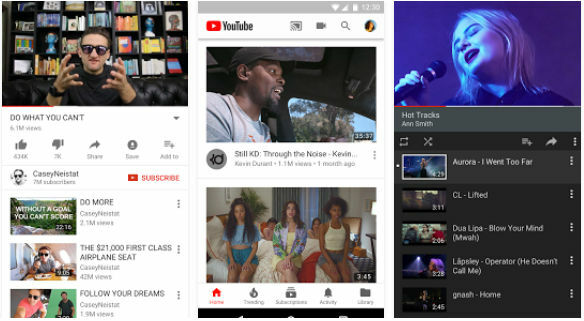 Users can subscribe to their favorite channels on YouTube. The video streaming service sends an alert email whenever a new video is uploaded to channels in the user’s subscription list. YouTube detects your internet connection speed and sets video quality automatically. If the video is buffering, you can change the playback quality to improve your video watching experience. The app allows you to watch videos in landscape and portrait modes. 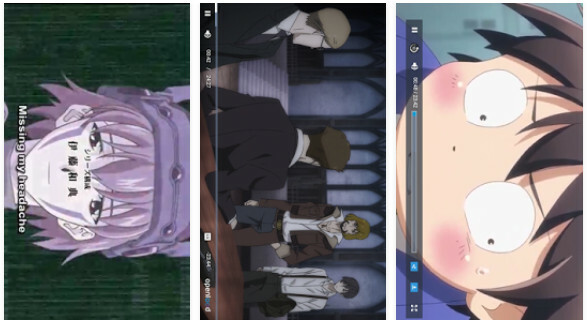 In some countries, YouTube lets users save anime episodes for offline viewing. The video hosting service allows you to comment on the videos. You can like videos you’ve enjoyed watching and dislike the ones you’ve found boring. If YouTube is blocked in your country, install one of these VPN apps. 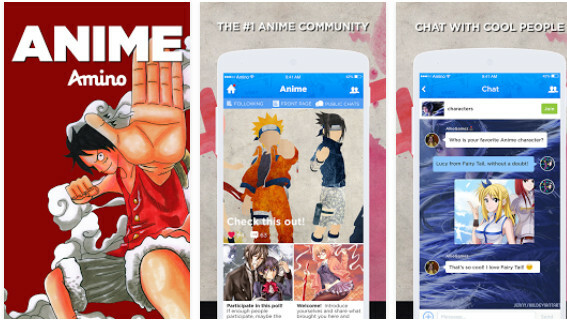 Anime and Manga Animo is a top-rated social networking app for anime lovers. It is an ultimate app to discover new animes and mangas. The app lets you follow other users. It includes a Facebook-like feed. You must open this interface to learn what users you follow are up to. The app lets you create new polls, wiki entries, and quizzes. You can ask questions to other users and share video URLs or images on your wall in Animo. If you’ve enjoyed watching an anime show or you’ve have just finished reading a cool manga, you can help other users in discovering new stuff by writing a blog post in this app. Animo has the option to prevent other users from commenting on your wall. It has a special feature called Achievement Level. The Level of newbie users will be 1. To increase your reputation/level, participate in group discussions, chat with other users, share photos, links, etc. The highest achievement level in the Animo app is 20. Another cool feature of Animo is the shared folder that boasts a list of recently shared anime videos. The app has a search option that helps users in finding new animes and friends. You can create and join groups in Animo. 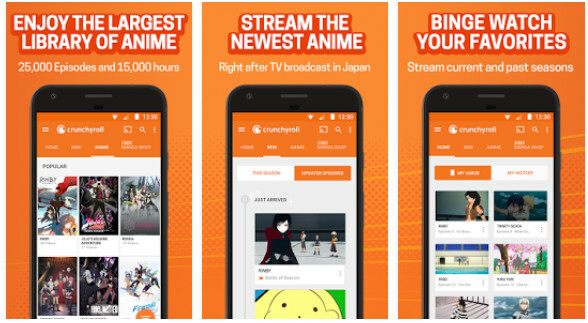 Crunchyroll is yet another popular app to watch animes on Android devices. It has a beautiful tabbed interface. As the app is easy to use, finding new animes is easy for the user. Crunchyroll displays a list of Animes in a grid interface. If you don’t like the grid view, you can switch to List view in Crunchyroll. 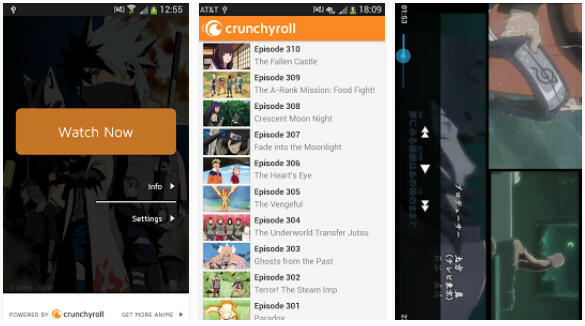 To see the list of episodes, users must select an anime by tapping on its thumbnail. Once the list appears on the screen, tap on the episode you want to watch. Now, the app will switch the video view/layout to landscape mode and it will load an advertisement. Once the ad stops playing, CrunchyRoll’s inbuilt video player will begin playing the video. The built-in anime player of Crunchyroll provides basic features. It lets you stream videos to other devices. It boasts a toggle option to enable the AutoPlay feature. Crunchyroll supports subtitles. You can bookmark your favorite animes to watch them again later in this app. Crunchyroll supports 9 languages. By default, it downloads and saves the thumbnails of animes to the storage memory of the phone. The option to turn off this feature is present in the settings panel of Crunchyroll. Aozora is a great app to discover new animes. Like Animo, this app requires account registration. 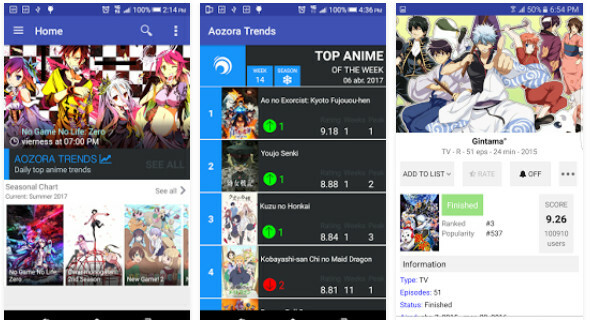 Aozora allows you to track the ratings and rankings of your favorite animes. You can watch trailers of the upcoming animes in this app. Aozora allows users to create and manage 5 lists – watching, planning, on-hold, completed, and dropped. It lets you sync these lists with the MAL service (MyAnimeList). If you come across a new anime show in this app, you can read its detailed review before watching it. The app allows you to filter animes by their genre, year, production studio, and classifications. Auzora users to join the official Auzora forum where anime-lovers across the world discuss various things. You can follow other users and rate animes in this app. Aozora uses this rating to compile the list of top Animes of the week. A premium video subscription service, Netflix lets you enjoy popular Japanese Anime shows and movies in HD and Ultra HD quality. Netflix has been beefing up the anime collection since 2016. Initially, the video streaming service allowed users to watch just handful of shows. Now, you can enjoy 30+ anime shows and movies on Netflix. When you join Netflix, you can watch or download your favorite animes on a smart TV, or mobile phone. Netflix is smart video streaming service. Videos you pause on TV can be resumed on the phone. The Netflix subscription plans start at $10. You can try the premium subscription for a month before buying the subscription. Naruto is one of the most watched anime series on the planet. It has 500+ episodes. The best place to find and watch the full Naruto episodes is the Naruto Shippuden app. NS is an intuitive app powered by Crunchyroll. It doesn’t require account registration. The app’s main interface boats a large button. Tap on this button to see the list of Naruto episodes. The episodes are sorted in descending order of their Airing date. Before playing the video, NS will load a page that has information on the premium plan. If you want to enjoy Naruto in HD quality, tap on the signup button and pay the subscription fees. If you’re happy with the SD quality, tap on the “No Thanks” button. Anime Watch is yet another top app to watch anime episodes for free. It gives users access to 100s of animes of 18 different genres. The built-in video player of this app allows users to pause/resume the video streaming. Kissanime’s app includes a search utility, but it doesn’t have a category filter. If the video is in the Japanese language, the AW app will display English subtitles. You can bookmark videos, enable audio effects and change the video streaming settings in this app. The only drawback of Anime Watch is that you cannot change the video streaming quality. Animo, YouTube, Netflix, Anime Watch, Crunchyroll, Aozora are the best apps to watch anime on a mobile device or smart TV.